The 17th international ESCAP Congress in Geneva, Switzerland, is currently accepting abstracts. This major event on child and adolescent psychiatry will take place at the Centre International de Conférences Genève – CICG, from 9 to 11 July 2017. Deadline for abstract submission: 30 December 2016. Go to the congress website. 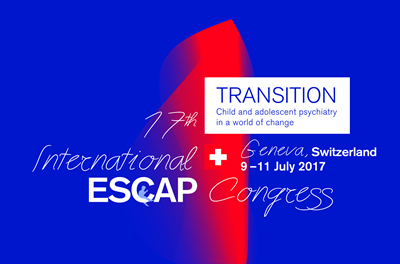 ESCAP will be keeping you up-to-date on the programme, backgrounds and insights from the keynote speakers The Swiss association for child and adolescent psychiatry (SSPPEA/SGKJPP) will enable us to keep you informed in German and in French, as well as in English. Please view our website and News Alerts for updates.